WACO, TX — Monday is the last day to file income tax returns for the 2018 year. Some businesses plan to be open for longer hours to accommodate last minute filers. 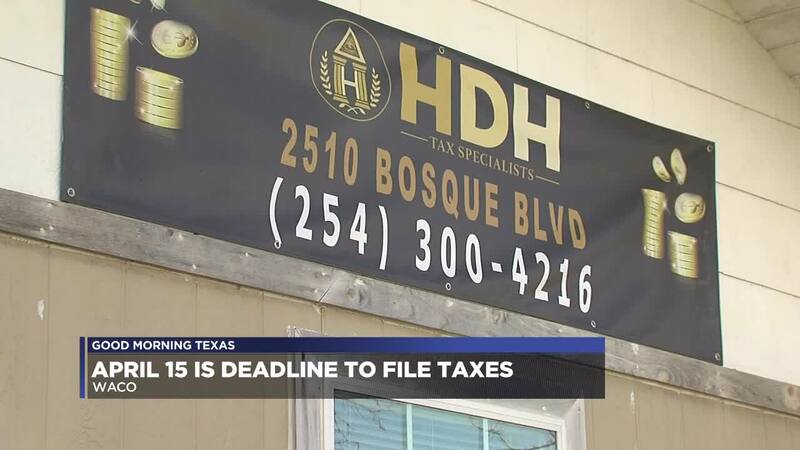 HDH Tax Specialists located at 2510 Bosque Blvd in Waco will have extended hours on April 15. It will be open from 10 a.m. until the last customer comes in. "It's important to get every single wanting to file tax filer, filed," HDH General Manager Jimmy Haliburton said. On Tax Day, H&R Block offices in Waco will be open from 9 a.m. to 9 p.m. Jackson Hewitt offices in Waco will be open from 9 a.m. to 10 p.m. The Internal Revenue Service statistics from recent weeks show the amount of refund money given to taxpayers thus far is slightly lower than in previous years. Karen Freyer, who filed her taxes at the beginning of this tax season, recalls filing late other years when she didn't expect to receive a refund. "You start out when tax season starts to get your estimate, you know what is going to happen. You know you have to gather those funds," Freyer said. For those who will be filing on the last day, Haliburton recommends them to have their documents ready. "You want to give yourself ample time to talk to your tax specialist. That way if they are additional credits or deductions that you may have not known of and some additional information is required in order to make a possibility for you. Then you have the time to get that information," Haliburton said. Taxpayers who are unable to file by 11:59 p.m. on April 15, are recommended to file a tax extension, which will allow them to file their tax return by October 15. "We want to avoid as many penalties and interests as necessary. That's just money going out the window for not filing a tax return or an extension," said Haliburton. Taxpayers can apply for an extension online or with the help of a tax specialist. Military service members who are in combat zones have at lease six months after they leave that area to file and pay their taxes. For everyone else who can't pay their taxes today, the IRS does have some payment plan options.